Joint compound comes premixed or as a powder that when mixed with water to forms a thick, pliable paste. Typically, wallboard joint compounds are drying, meaning the water evaporates from the paste or setting. A chemical reaction causes the compound to turn from a soft paste to a hard surface. Adding excessive amounts of water causes wallboard joint compound to become runny and unusable. Thickening the compound makes the wallboard joint compound usable. Joint compound helps smooth wall seams. Install a paddle mixer on a power drill. Submerge the mixing paddle into the runny joint compound. Turn on the power drill to mix the compound thoroughly. Sometimes, joint compound appears runny because the compound isn't properly mixed. Sprinkle enough powdered joint compound over the top of the runny mix to create a thin layer. Match the joint compound powder mix to the existing joint compound. Use drying-type only with drying-type and setting-type only with setting-type. Submerge the paddle mixer into the joint compound. Turn on the power drill to mix in the powder into the existing wallboard joint compound and thicken it. Check the wallboard joint compound consistency to determine if sufficient thickening occurred. 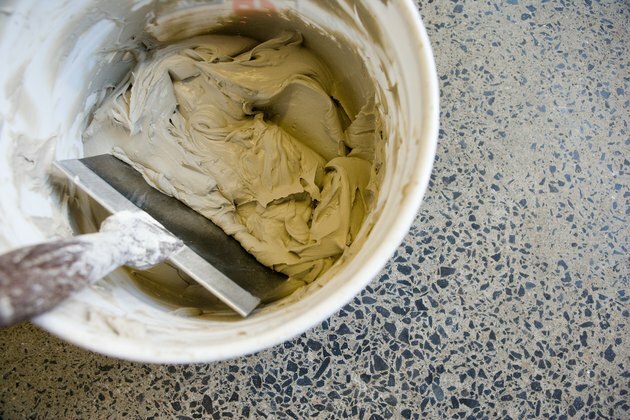 If the joint compound remains runny, slowly add more powder mix and blend it in with the paddle mixer until the wallboard joint compound develops the correct consistency.